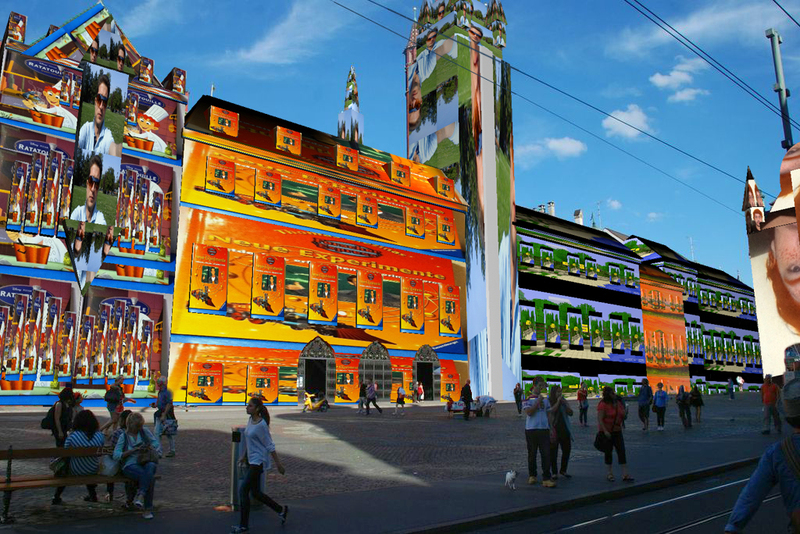 My Mirror City – Will Pappenheimer – MyMirrorCity transforms the areas of the cityscape into virtually mirrored buildings. The project harnesses the widespread use of instant cell phone snapshots, “selfies,” uploaded to social media space as self reflection, as momentary chronological diary or personal identity. This daily practice, this obsession, now appears writ large. Participants leave their building sized images until the next users decide to add their own. A dialogue from one person to another is created through the ubiquitous presence of the participants’ imagery. 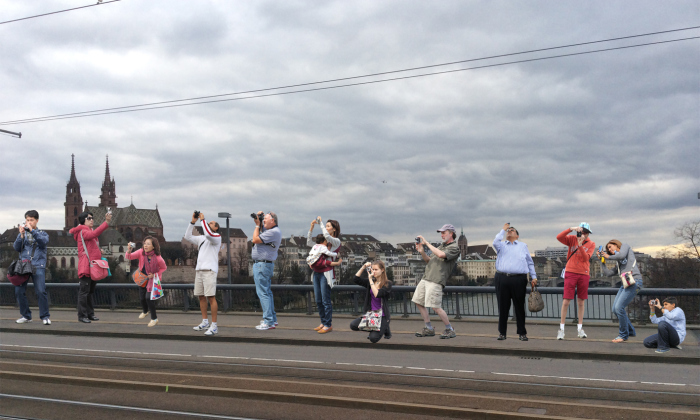 Participants take a cell phone picture of themselves or surroundings, upload it, and it then appears on every facet of all the buildings around them in augmented reality space. When a second person uploads their image, it appears on alternate building facets such that a self-image dialogue is created. The cityscape, now viewed through the cell phone or ipad, is a multi faceted architecture of this interpersonal relationship of image exchange and juxtaposition. Dose – Will Pappenheimer and Virta-Flaneurazine – Dose is an invisible hallucinatory experience perceived through the users mobile device. Originally developed through the artist pharmaceutical, Virta-Flaneurazine, the psychic journey lasts for about 15 minutes before it reaches a completely enclosed ephemeral space. The optimal experience is initiated by licking the large white pill shape on a mobile device that appears when the QR code is scanned from within the LAYAR application. Shades Of Absence: Public Voids – Tamiko Thiel – is a series addressing censorship in the arts. 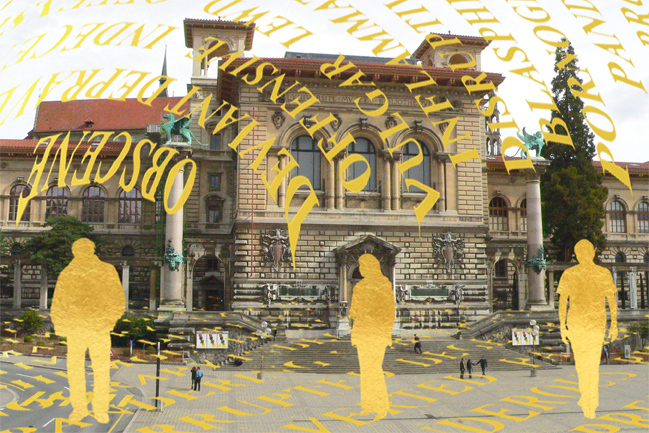 In these pavilions of absence, censored artists are reduced to gold silhouettes and placed in the midst of terms of transgression. Each erased silhouette represents countless lesser known artists who face censorship or persecution with no public support. When viewing the artwork on site, touching the display brings up a list of censored artists, including the artists depicted. “Public Voids” addresses artists whose works in public spaces have been censored. “Shades of Absence” was shown as an official parallel program to the 2011 Istanbul Biennale, and in 2013 the Corcoran Gallery of Art and College of Art and Design in Washington DC commissioned a permanent installation, “Governing Bodies,” as a memorial to Robert Mapplethorpe and other artists censored by US government officials. Things We Have Lost (Passive Version) – John Craig Freeman – Using place-based augmented reality technology, EEG AR: Things We Have Lost is a citywide public art installation consisting of dozens of virtual objects representing the things that the people of Basel have lost.In January of 2014, people were selected at random in the streets of Basel and simply asked, “What have you lost?” The location was recorded and a series of virtual lost objects were created based on the responses given, things such as pensions, empires and dodo birds. The objects were then placed back in the exact GPS coordinates where the encounter took place, creating a citywide network of lost things. The virtual lost objects are viewable on any mobile device. 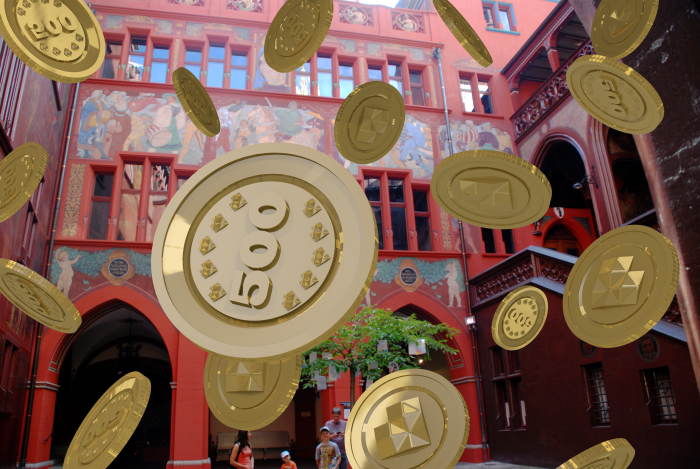 Money Can’t Buy You Love – Curious Minds + Guests – To celebrate the 500 years of the Rathaus, a project was thought up that would give young people a chance to express their ideas about future and finance in a novel and tech-savvy way. Animations are created during a workshop where each designs a currency, decide its value, and what can be obtained with it. Using a mobile phone, visitors can look through the camera of their phone to see the coins falling from the sky and by touching any one an animation plays. Meet The Music – Curious Minds + Guests – The project “Meet the Music” gives living composers a unique opportunity to create and present their work. The project takes a step forward by offering composers something more than a just stage; it offers them a new way to come in contact with music lovers. 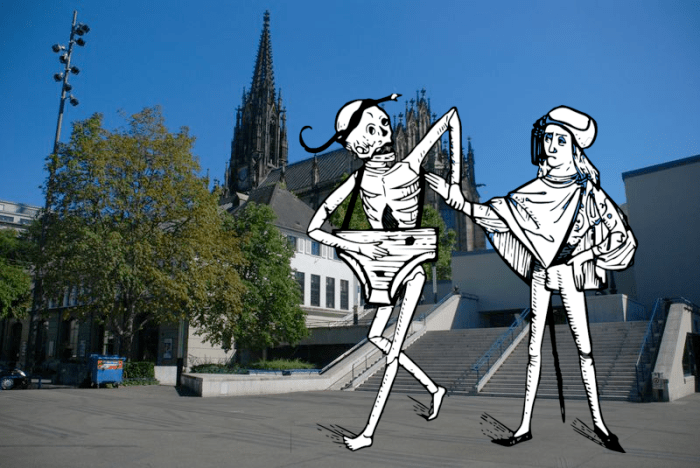 This is accomplished by making collection of short music works (Danse Macabre) available by placing them into virtual space using Augmented Reality techniques. Here, semi silhouette images of the composers or performers are spread out in public space using GPS coordinates to place then. Using a mobile phone and a downloadable applications, each of the silhouette images can be seen through a the mobile device when at the geographic location where one of the silhouettes has been placed. Clicking on the image triggers an animation and the music begins to play. Water Lily Invasion – Tamiko Thiel (Ferry) – As global water levels and temperatures rise, plants and animals mutate to adapt. Strange new creatures arise at the interstices between plant and animal, transgressing the boundaries between reactive flora and active fauna. In 2013, one such form – an invasion of strangely reactive water lilies – was observed on the Star Ferries route in Hong Kong. 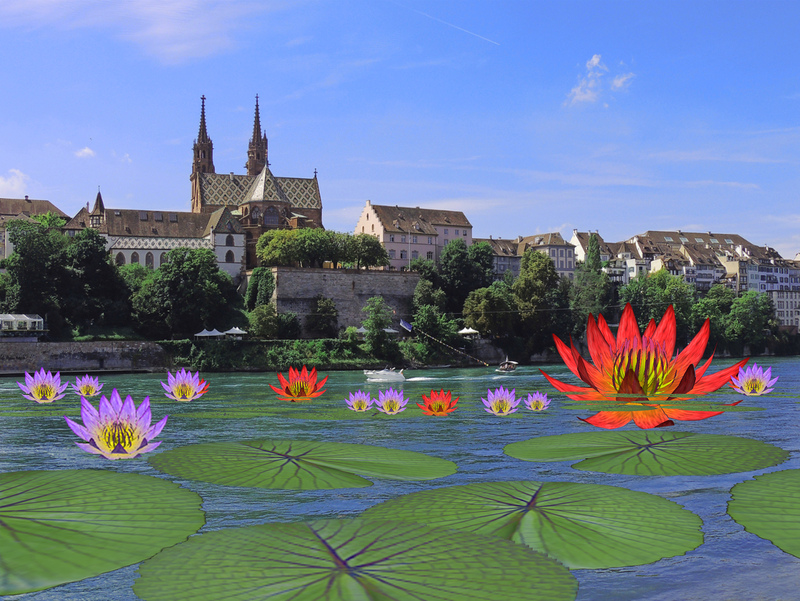 In 2014 the water lily invasion reached Europe – in the Rhein River at Basel, Switzerland. Scientists hypothesize that they feed off energy dissipated by ferry boats, the human cargo and their electronic devices. Sensitive to the mediated human gaze, a small, innocuous water lily can enlarge to engulf viewers who focus it in the display of their mobile app. Until now viewers have reported feeling no effects other than a temporary fibrillation. Scientists worry however that future mutations could cross boundaries between insentient plant and sentient, perhaps even carnivorous life forms. People We Have Met But Don’t Remember – Peter Aerschmann – the work created by Peter Aerschmann for the Virutale Switzerland has its roots in how the artists has been experimenting with the visible and the hidden using both still and moving imagery. The images selected are virtual and combine in their presentation in reality in an extreme ironic manner and extend event further the artistic basis of his work in that, it puts the visitor in check being able to distinguish between everyday reality and fiction. 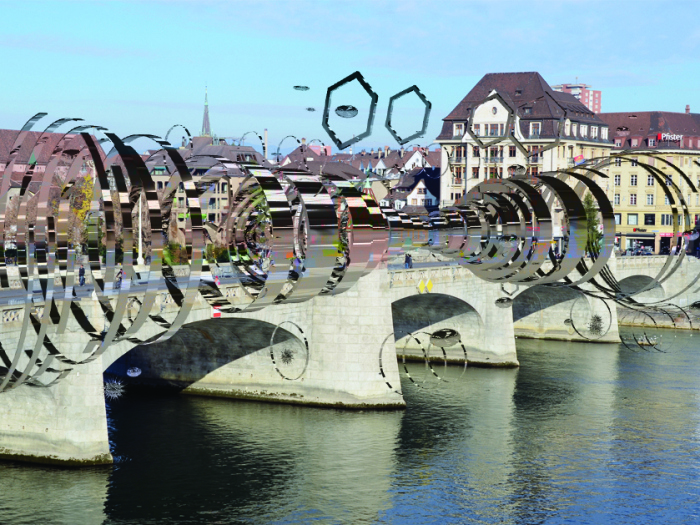 Vision / Tunnel – Franziska Furter (Bridges) – Through a process of replicating, enlarging, and modifying, a two dimensional drawings is developed by referencing of drawn imageries. Organic structures and cosmic representation play with an ambiguity of aggressive appearance and extreme fragility as sizes shift and time expands and implodes in a strange artificial, illuminating light casts of black shadows. Things We Have Lost (interactive Version) – John Craig Freeman – Using place-based augmented reality technology, EEG AR: Things We Have Lost is a citywide public art installation consisting of dozens of virtual objects representing the things that the people of Basel have lost.In January of 2014, people were selected at random in the streets of Basel and simply asked, “What have you lost?” The location was recorded and a series of virtual lost objects were created based on the responses given, things such as pensions, empires and dodo birds. The objects were then placed back in the exact GPS coordinates where the encounter took place, creating a citywide network of lost things. The virtual lost objects are viewable on any mobile device. Biomer Skelters – Pappenheimer & Thiel – Biomer Skelters is a participatory public artwork that connects body rhythms to potential ecosystems as it repaints the cityscape with prolific virtual flora. 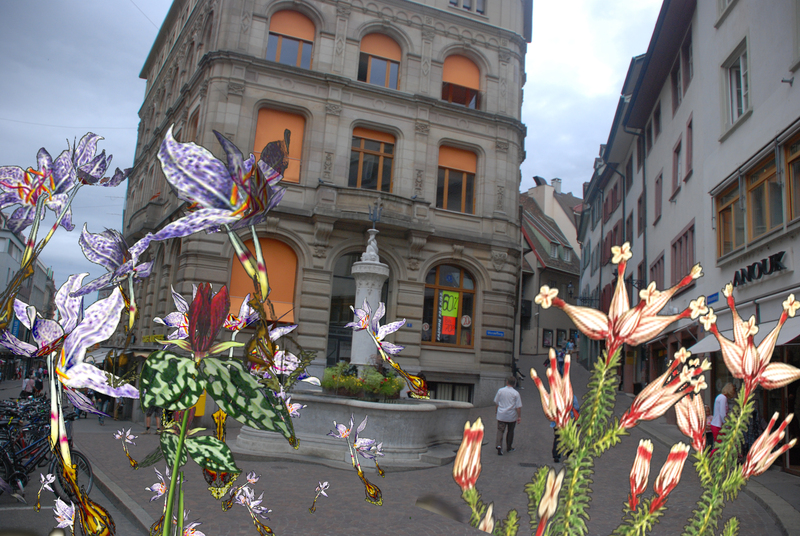 As participants walk the streets, a simple wearable biosensing system, employs their heart rate to plant and populate their path with fantastic augmented reality vegetation. The interior energy of the body, always at the edge of conscious control, is the generator of this wild growth wake, forming “helter-skelter“ ecosystems that begin to overwhelm the city. A unique relationship transpires, linking the visceral to the virtual. Mind-body states cause network instantiation, just as what is instantiated in locative AR space becomes, in some sense, manifested in the real space. The fields and forests of vegetation left behind, trace the participants changing psychosomatic condition and transform the cityscape as medium. Biomer Skelters also has a competitive dimension. Participants choose between flora of two contrasting biomes, those that are local or “native“ or “foreign” or “exotic” to the area. Thus, the city becomes the contested site of notions related to conservation verses possible climate transition. 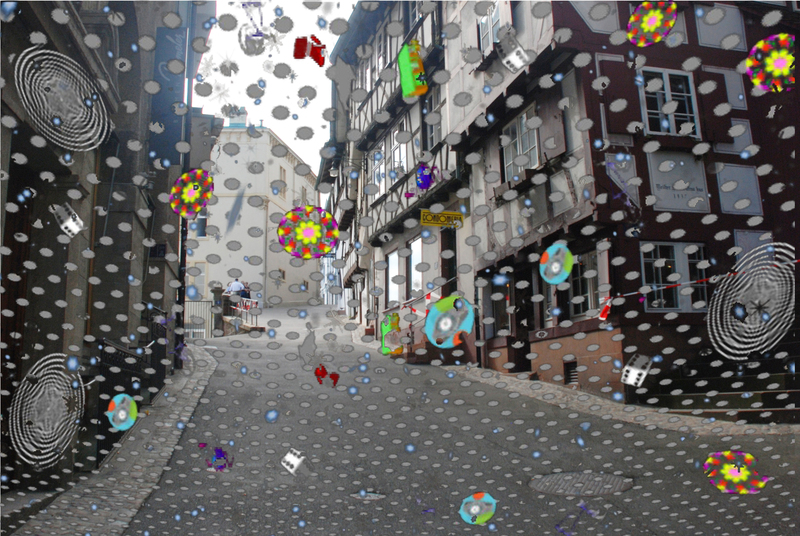 An ecological “game” emerges, visible on the streets through mobile devices and topographically on Google Maps. PAUSE – Lalie Pascuale – PAUSE is a journey in time made of a series of animations which are historically and culturally linked to the cities of Virtuale. Each animation, a PAUSE in time, invites viewers to explore the space between the virtual and the real, and to discover new encounters between past, present and possible new beginnings. 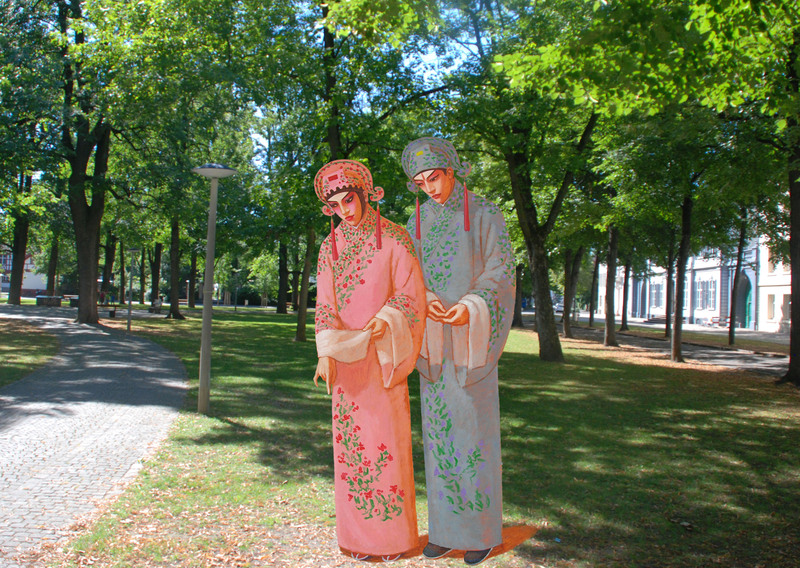 The Butterfly Lovers – Lily & Honglei – Derived from a popular Chinese folktale Butterfly Lovers, the painted figures in traditional costumes are placed at varied locations around the world. 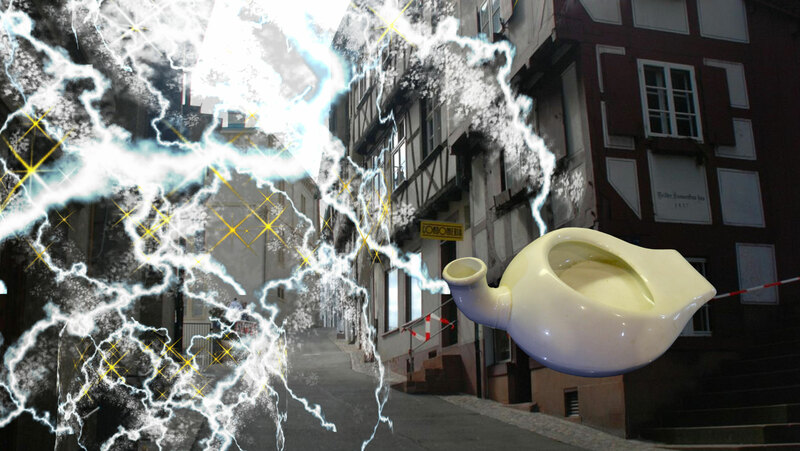 Utilizing Augmented Reality, the work addresses issues of Chinese diaspora and cultural identity, and visualizes the restless, roaming cultural spirit of the East hidden in western metropolis.